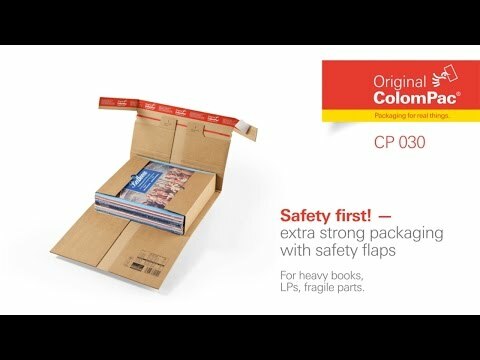 Colompac CP030 extra secure postal box folder, suitable for packaging LPs (vinyl records). Colompac's robust design means this folder can accomodate varying heights, making it suitable for sending a wide range of products including LPs. - Self-adhesive and tear open strips - fast and easy packing and opening. - Safety flaps provide reinforcement for heavy goods and added security, preventing theft of the products from the side. - Made from thick corrugated material for extra packaging strength. - Print these with your own design or logo. Find out more about branding your LP Folders or send us your enquiry.